To wrap up our coverage of this year’s Tastes of Latin America festival, we bring you a long overdue review of Poncho’s Mexican Restaurant. 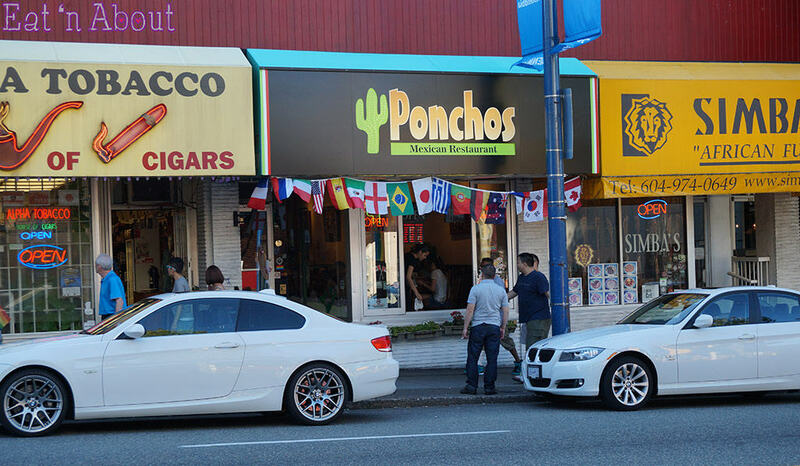 Poncho’s is Vancouver’s second-longest running Mexican restaurant, and they are the longest-running if you base it on never having moved locations. They’ve been at the West End hub of Denman and Robson streets since 1988, and just celebrated their 26th anniversary this Canada Day! Staying in business that long must mean they are doing something right. We chatted with owner Kaeta who is definitely part of Poncho’s charm. She is the friendly and outspoken owner/operator/server/entertainer (and also a former culinary instructor on Mexican cooking). She is full of neat anecdotes about Mexican food and the stories behind the dishes. Pandesally—my bro who came along for this review—and I also ran into an old friend of ours from Alberta at Poncho’s. He said whenever he’s in town visiting he has to stop in at Poncho’s for their flaming coffee…read on for more on that drinko loco! We started our meal with some complimentary chips and salsa. 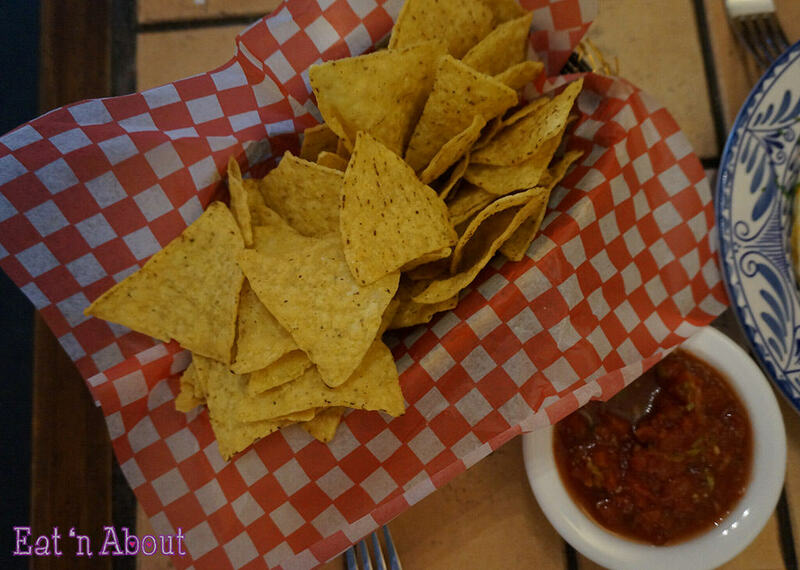 The chips are handmade locally and delivered fresh every second day. The salsa is made in-house and was quite delicious. We were given some Habanero salsa too (not pictured), also house-made. Both were medium-hot with only a slightly bigger kick from the Habanero version. For the Tastes of Latin America menu Poncho’s offered their Paella and Dinner for Two in individual portions at $25 and $20 per person respectively. We chose the Dinner for Two which includes appetizer, entrée and dessert. 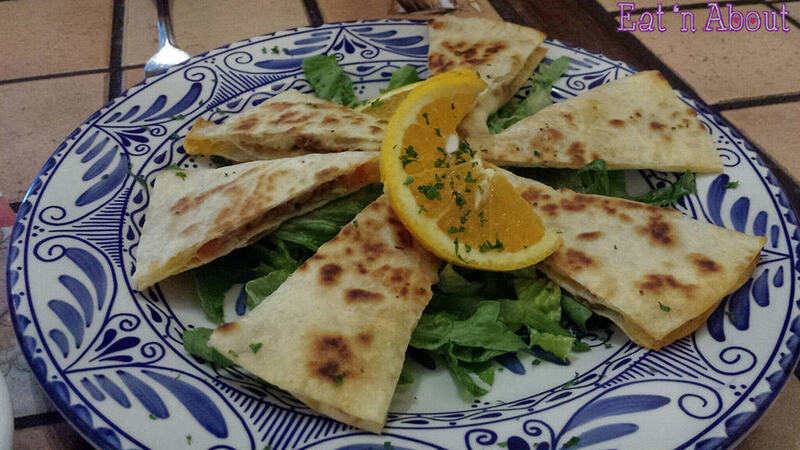 First up was the Quesadilla. This dish includes their house-made chorizo along with a cheese blend and red and green peppers. I didn’t find the chorizo as flavourful as it could have been but there was an adequate amount inside. Not bad, but nothing out of the ordinary here. 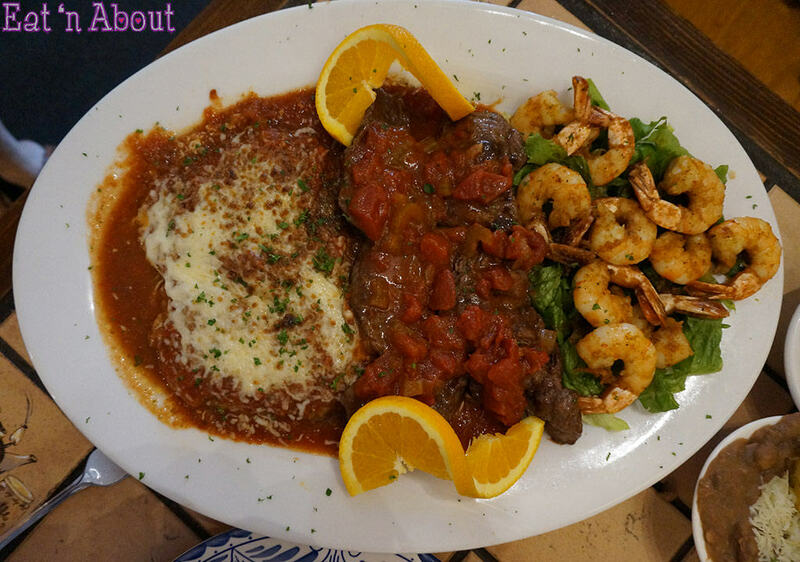 The entrée included 10 jumbo garlic prawns, two beef tenderloin topped with Poncho’s sauce, two chiles rellenos and two sides: beans and rice. The rice is home-made in a pilaf style. The prawns were the dinner highlight. They were more cuminy than garlicky due to the secret spice blend, and were large, juicy, and lightly cooked to perfection. The spice mix did not overpower the taste of the ocean, which I liked. Pandesally and I agreed that the beef was not a quality cut, but it was a big portion given the price. I’m not a big fan of the steaks served in home-style Mexican restaurants because I usually find them a bit tough and dry, but Poncho’s version was pretty moist, albeit chewy. I did however find it overly salty and Poncho’s sauce tasted mostly like canned tomatoes to me. Pandesally on the other hand found all the dishes perfectly salted for his tastes. He also wanted to add that he appreciated the contrasts of the dishes on the platter. We finished it off with the chiles rellenos. The chiles were dipped in egg, breaded, and covered in red sauce, with cheese inside and cheese on top. Pretty decadent stuff; we both enjoyed the cheese overload. We probably should have eaten these first while the cheese was still gooey though. One nice thing about the platter was they provided just the right amount of sauce. There wasn’t any waste left to speak of on the platter at the end of the meal. Alberta friend ordered the two portions for himself; needless to say he didn’t finish despite a valiant effort! 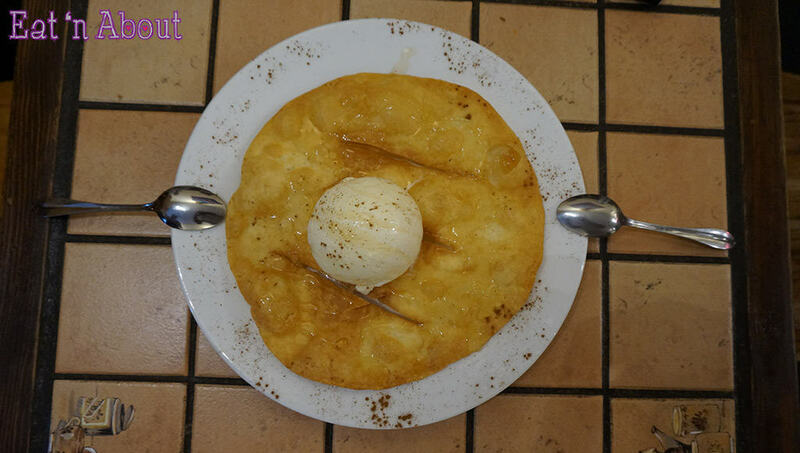 This is the dessert bunuelito, a flour tortilla fried to a crisp and topped with honey, cinnamon, and a scoop of vanilla ice cream. Simple and satisfying; just enough to satiate your sweet tooth if you have room left at the end of the night. For those who don’t have the stomach space for a solid dessert, you can try Poncho’s signature flaming coffee ($11.95). It’s a sight to behold as you can see from the video. The flames are sparked by a mixture of Kahlua, Grand Marnier, and brandy. 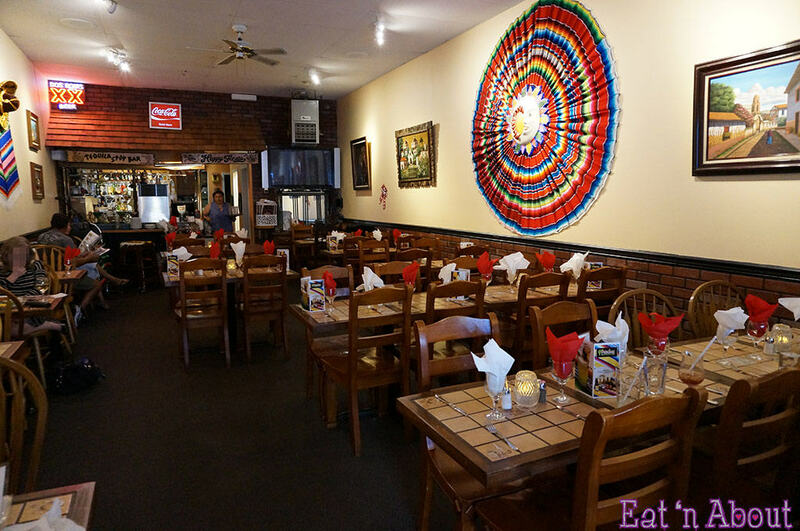 Poncho’s also offers live music every Saturday night (and some Fridays), and are open for lunch on weekends and special event days during the summer months. Oh, and they serve Wendy’s coveted Tres Leches (three milk cake)! I didn’t get a chance to try it on this visit but they will be offering it as part of a ginormous meat platter for four which they are launching in a week or two. At only $20 a pop this should be a great deal for group dinners. Pandesally liked Poncho’s even better than our recent visit to personal fave Taqueria Playa Tropical, but I felt Poncho’s hovered only slightly above the average mark. So I guess in conclusion if you’re looking for fairly reasonable food at a reasonably fair price along Denman St. Poncho’s Mexican Restaurant is worth a look. Adios! Disclaimer: This meal was provided free of charge for review purposes.